Back-to-School Giveaway: A Modern Eden Prize Pack! If you’re not familiar with A Modern Eden, you’re in for a real treat. 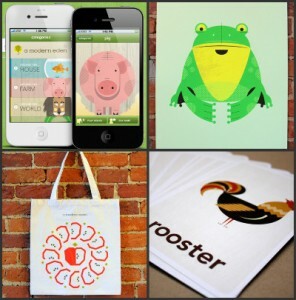 They offer a range of products decorated with their unique and whimsical animal designs, including some FREE bling for your iPhone and desktop! We especially liked the animal flash cards for their appeal to a wide range of ages. Be sure to check out their awesome, kid-friendly iPhone app “Speak Piggy!” that has been getting fantastic reviews around the internet. This easy-to-use app takes children on a journey through the jungle, the farm or around the house, introducing them to animals’ names and sounds. This adorable app has kept my two-year-old occupied for hours. To enter, tell me what your favorite A Modern Eden item is. 1. Leave a comment. What is your favorite A Modern Eden item? 3. Follow @DealSeekingMom and @amoderneden on Twitter and tweet the following. Be sure to come back and leave a separate comment with the link to your tweet! This giveaway ends at 11:59 p.m. ET on Saturday, August 14th and is open to all U.S. residents 18 years or older. I’ll use Comment Contest to select the winning comment. Winner will be notified by email and listed on my Giveaway Winners page. Winners must respond within 48 hours of notification to claim their prize. Good luck! While you’re in a contest entering mood, don’t forget to check out all the bloggers participating in these Back-to-School Giveaways! I have the peacock as my screensaver! The iphone apps are great. I didnt see it for sale but I want a poster of the Owl on their facebook page ,but as for what is for sale currently ,Presley the peacock poster won my heart,totally! ;0)Thanks for hosting! I like the Apple Cotton tote bag & would give it my sons second grade teacher full of extra school supplies & a few treats for her.